Ed offers a discount of 50% on their first / introductory lesson! 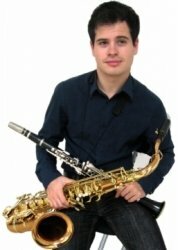 I am a Bristol based Clarinet/Saxophone Player/Singer/Composer. I began playing at the age of 8 and have since gone on to perform as a soloist and in various ensembles in the Bristol/Lancaster/Huddersfield areas. I love to perform, and teaching others to achieve their full potential with their chosen instrument(s), whilst having fun, is such a joy! Having played in various ensembles I have a wide repertoire of music through Classical, Jazz, and Contemporary genres. I also received the Huddersfield University 2014 Woodwind Prize for my performance ability and involvement at the university. I have been taught by a number of tutors over the years: Ben Waghorn, Paul Stinchcombe, Quita Colston, John Woodhouse, Sarah Markham, and most recently Joel Purnell, and am able to incorporate elements of the way they teach with the way I found comfortable learning. During my time at School and University I was participating in and leading ensembles, both small and large. I feel that this experience helps my ability to teach others by having a diversity in genres and learning environments. I have been teaching for almost five years now and always incorporate an element of enjoyment in my lessons. It is a fantastic experience seeing your students progress. Whether going through the grading system or just playing for fun, I structure lessons around the students own ability and what they want to achieve. I believe that music should be a fun and shared learning experience, where the student has just as much say as the tutor. I encourage learning to play in various genres and working with theory too should the student wish it. EdFrom Alan (5/5): Our daughter wanted to learn Sax outside of formal lessons and grades and Ed has been spot on working with her on both technique and theory in a way she has enjoyed. This has included improvisation and playing along to backing tracks to build up confidence. All in all it has and continues to be a good experience. With GCSE's looming she still wanted to continue as quote "he is the only sax teacher I have actually liked". Reply from: Ed: Thank you Alan! EdFrom Demitri (5/5): Ed is an excellent teacher who balances flexibility of learning with technicalities of the instrument. For example, on expressing an interest in clarinet improvisation, we have been doing some form of improvisation every lesson but at the same time developing the skills of writing music and learning to be expressive with the instrument. I have noted a significant improvements in my playing thanks to Ed's suggestion of recording practice sessions which we also review in lesson. Overall I would highly recommend Ed as a music teacher since since he is flexible with regards to your musical interests. Just be sure to do the exercises he sets as homework in order to fully benefit. Reply from: Ed: Thank you Heather, I'm glad you enjoyed it! EdFrom Kaz (5/5): It is fun to learn with Ed because he makes each class very useful for my current skills. I noticed my improvisation skills have greatly improved since I started taking lessons with Ed. Sometimes I bring up some points to improve, and he can find material and tracks on the spot. He gives me instant spot-on feedback after every improvisation, and I redo it to address these points. I also receive lots of encouragement which reassures my progress. I always look forward to going to the next lesson because I know it’s going to be fun and helpful. Reply from: Ed: Thank you for the kind words Kaz! EdFrom Deva (5/5): Ed is a great teacher. Patient and supportive, his teaching style is both accessible and enjoyable. His knowledge and passion for the saxophone are evident and transfers over easily, leaving you with the confidence and desire to keep learning. Would highly recommend Ed as a tutor. EdFrom Natalie (5/5): Ed is a wonderful tutor, very patient, knowledgeable and calm. I am enjoying learning to play the saxophone and am glad I found one locally who happened to be Ed . Reply from: Ed: Thank you so much for the kind words Natalie! EdFrom Jessica (5/5): Ed is a fantastic teacher. He teaches my 17 year old son Saxophone who has no music teaching up until now. My son loves Eds lessons. I have found Ed to be reliable and very quick to get in touch with any information regarding times and any other relevant information. Reply from: Ed: Thank you for the kind words Jessie! EdFrom Sean (5/5): I have had lessons with Ed for just over 3 months. He has been an excellent teacher. He is patient and always supportive, and gives good advice and tips on how to overcome difficulties in practice. He is knowledgeable and integrates theory into lessons in a way that makes sense. He is able to cater for interests in classical, jazz and other styles, and he makes an effort to keep the experience of learning an instrument enjoyable. I would strongly recommend Ed as a tutor.